Tracksounds: UPDATED: Are You a Trailerhead? Enter to Win 2 Concert Tickets to Trailer Music Live! UPDATED: Are You a Trailerhead? Enter to Win 2 Concert Tickets to Trailer Music Live! UPDATED: JUNE 10, 2009 - Now, open to any and all to enter! 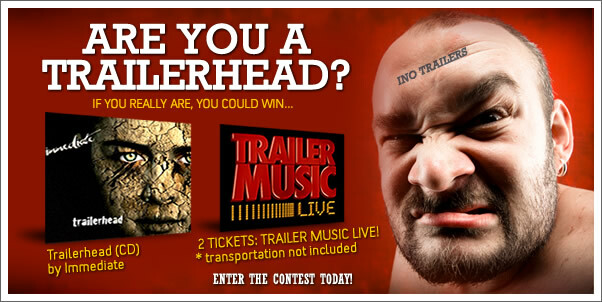 Win 2 Tickets to Trailer Music Live and Trailerhead by Immediate. We are excited to have partnered with Imperative Records to offer you a chance to win 2 tickets to the upcoming TRAILER MUSIC LIVE! concert on June 27, 2009...as well as their official release, TRAILERHEAD. Simply supply the movie titles for the FOUR trailer screen shots we present and you could win!